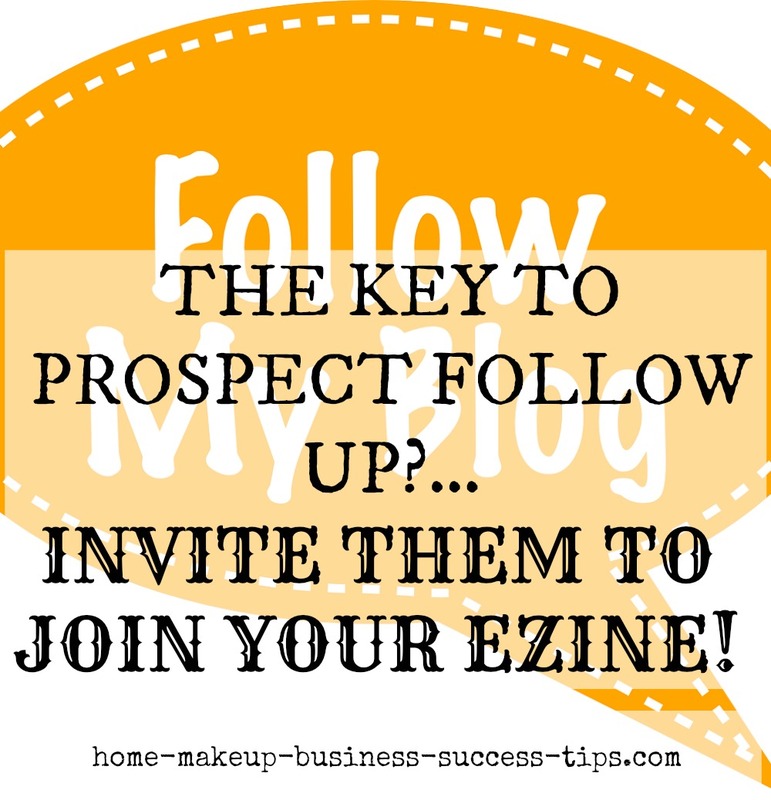 As we have learned in the section How To Attract All The Home Makeup Business Clients You Need, the key to following up with your prospects is to invite them to join your ezine list and then you can follow up each week without adding any extra effort on your part. Here we will discuss a few simple ways to follow up with your prospects including your number one and most important tool, the e-zine. Lets just assume for a moment that you have begun to capture your prospects information; i.e. name, email address, finding and meeting them thru networking, referrals, organizations and other ways of meeting people. You have made a positive impression on those you have met, and want to stay in touch. Well, next comes the follow-up. With consistent and systematically implementing follow-up methods, you will separate yourself from those who dont. Well I want to tell you that it doesn’t have to be so difficult and time consuming. It only can become this way if you do alot of unnecessary, time consuming tasks. I am going to show you there are some simple to implement follow-up strategies that you can do in less than 30 minutes a week. It will get your name out there and will get you business and referrals without breaking your “Time Bank”. Sometimes, certain days or times are ideal for subscribers to receive your emails. Learn how to increase your follow-up messages' effectiveness with send windows. 1. Send each new person you meet a personalized thank you note: This can be handwritten if it is someone that you met in person, or you can send it virtually from your ezine sign-up page. If they have opted into your e-zine, the 1st email they should receive is a thank you for joining with a short note included. This was discussed in Build Your List. If you have not read this yet, take a minute to read this important information. Take immediate action within 24 hours of your 1st introduction or meeting with someone. 2. Take more than one action: Send something in the mail or email them- an introduction letter and a brochure, a thank you note (handwritten of course) or a flyer about your special promotion. Make sure that you always INCLUDE A LINK TO YOUR BLOG, so they can continue learning on their own time. 3. Use email wisely: If they have contacted you by email 1st then you can add them to your email database, as long as you are following correct spam laws in your correspondence, and make sure they get an email notice within 2 weeks. Unless it is someone that you know, I wouldn’t blatantly send emails. It’s not good business, and it can get you into trouble. 4. If you have connected with someone: and created a bond with them, then it would be great to attach an email or a document that you think might be of interest to them. A little effort and thoughtfulness goes along way. 5. Send more than one mailing: Be consistent with your correspondence. Sen out your ezine at least every other week, if not once a week. After you sent the first one, this can be more casual follow up tips or anything you want to share. 6. Get creative: If your prospect is local, try reaching out to them with a promotional flyer, offer to do a home makeup party or create gift baskets for them to give on birthdays or holidays. 7. Plan year-round promotions: Send out holiday cards not just in December, but also include other holidays as well. In addition you want to sen out birthday anniversary or whatever other holiday you can think of. Just remember that repeat business is 5-10 times easier to get than new business. So, not only do you need to follow up after you meet new people, you also have to cultivate those relationships over time so they keep you on top of their minds in case something comes up where they need your products or services or someone they know does. Have a Follow-Up Business Tip Success Story?